Credit card rates are on the rise. As we reported last week they've hit a record high average of 16% APR in CreditCards.com's survey of 100 popular cards. But Navy Federal Credit Union has announced it has lowered the rates on two of its popular cards -- the Platinum and Go Rewards cards, both of which were already well below the average. The variable rate on the Platinum card dropped two percentage points to start at 6.74%, going as high as 18%. The Go Rewards variable rate dropped to a starting point of 9.74%, and also has an 18% ceiling. 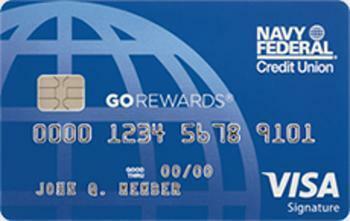 Neither card has an annual fee, or charges foreign transaction, balance transfer or cash advance fees. The Platinum Card is aimed at consumers who want low rates. The Go Rewards Card provides three points on restaurant purchases, two points on gasoline, and one point on everything else. Upon opening an account you get 20,000 bonus points if you spend $3,000 in the first 90 days. “Lower rates means members get what they want in their wallets,” said Matt Freeman, head of credit card products at Navy Federal. He says the reduced rate on the Platinum Card now makes it one of the lowest credit card APRs currently available. Both cards are available to credit union members. Navy Federal Credit Union membership is open to all Department of Defense and Coast Guard active duty, veterans, civilian and contractor personnel and their families. Credit card rates generally have been edging higher in 2017, mainly due to Federal Reserve policy. The Fed has raised its Federal Funds Rate twice so far this year, and that rate strongly influences rates charged by credit card companies. The Fed rate has been near 0% for years, as the Fed tried to stimulate the economy after the financial crisis. Even though economic growth remains lackluster, the Fed wants to return the Federal Funds Rate to normal. In doing so, it is increasing the burden on credit card customers who carry a large balance.